To all IU and Purdue inductees, in honor of the mothers here with us today, I would like to begin my recognition of the Class of 2016 with a brief story. In the 1930s, a young black man—the son of a teacher and a railroad porter—wanted to go to law school. Money was tight, and the nearby university refused to admit black students, so the young man went to a university further away at much greater expense. To pay for college, he waited tables, worked as a railroad porter himself, and worked at the library. When even this hard work wasn’t enough, his mother pawned her engagement and wedding rings to pay for his tuition. This grandson of slaves became a pioneering civil rights attorney, successfully arguing against school segregation in Brown versus Board of Education. He became the first African American Solicitor General of the United States and the first African American to serve as a Supreme Court Justice. This is how high our mothers and grandmothers raise each one of us. They are the reason for our success. Let’s give them another big round of applause. When you raise your voices together in this special place, you will hear a powerful chorus of success. You will get an idea of your class’s untold stories, the countless places you have been, and the history you have already made. And how high have your mothers and grandmothers raised you? Take a look around! You are the first IUPUI class ever to graduate in Lucas Oil Stadium. Today, in the crossroads of America . . .
here in the capital of Indiana . . .
the home of the Pacers and the Indy 500 . . .
you are graduating on the home field of the Indianapolis Colts . . .
where Peyton Manning recorded four of his five MVP awards . . .
where Big Ten and NCAA championships have been played . . .
where the Giants beat the Patriots in Super Bowl XLVI. And now you are making your own history here as the IUPUI Class of 2016. That phrase has a nice ring to it, doesn’t it: IUPUI Class of 2016. What do you think? Let’s hear it for the IUPUI Class of 2016. 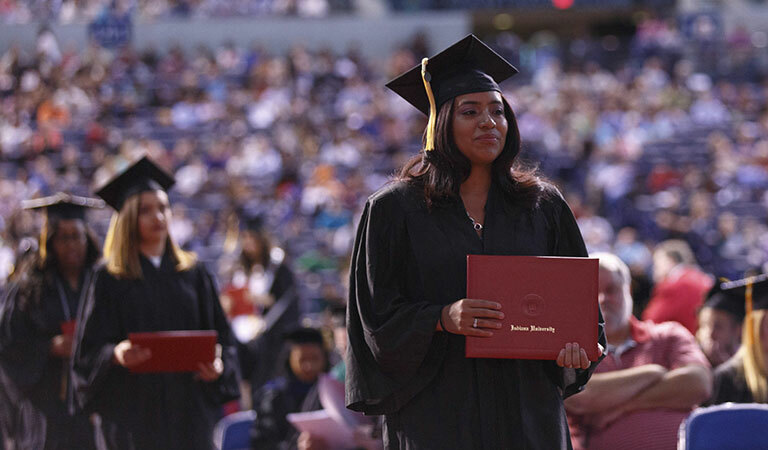 You can do better than that: Let’s hear it for the IUPUI Class of 2016. Every time I say Class of 2016, I want to hear your voices. 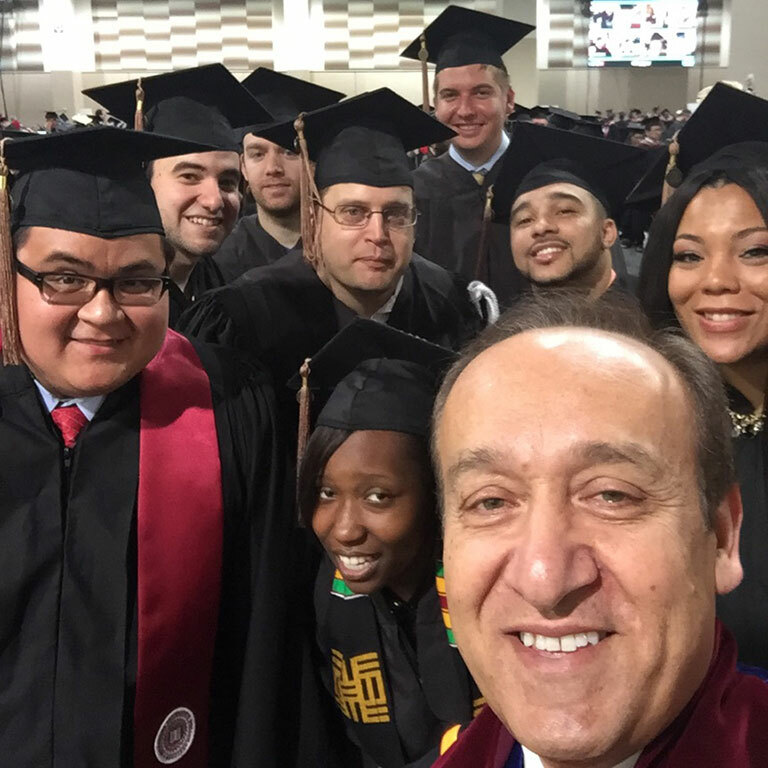 Highlights of IUPUI Commencement 2016, including a shot from our first official GoPro video of the ceremony! One of the voices of the Class of 2016 belongs to the president of the IUPUI Jagathon Dance Marathon who is graduating today with his degree in Exercise Science from the School of Physical Education and Tourism Management. He led Jagathon to its most successful year ever and is moving on to an internship with the IU Foundation. He found his direction at IUPUI. Another voice of your class belongs to a two-time All-American and summit league Player of the Year. She is the only active Division 1 volleyball player to record 1,500 career kills and 1,500 career digs, and she’s graduating with a double major in accounting and finance from the Kelley School of Business. And on this special day, I would be remiss if I didn’t include at least one mother among these graduate voices. She is married with three children and works part time at Ivy Tech Community College. When a serious ongoing health crisis pushed her toward online classes, she applied herself and succeeded. She will be earning her degree in Organizational Leadership and Supervision from the School of Engineering and Technology, and she wants her children to see in her a living example of perseverance. I can’t tell you how proud I am of each one of these students, and . . . really. . . of every student graduating today. These are three voices and stories of the 6,700 students graduating in the Class of 2016. When you raise your voices together in this special place, you will hear a powerful chorus of success. You will get an idea of your class’s untold stories, the countless places you have been, and the history you have already made. That is why Lucas Oil Stadium, here in the heart of Indianapolis, is the perfect place for you to graduate, Class of 2016. Where are you going next? Many of you are headed to your first jobs at non-profits and area businesses. Others will be taking their first academic appointments. Still others are headed to graduate school, dental school, medical school or law school. I’m proud to say that 90% of you will stay right here in Indiana! 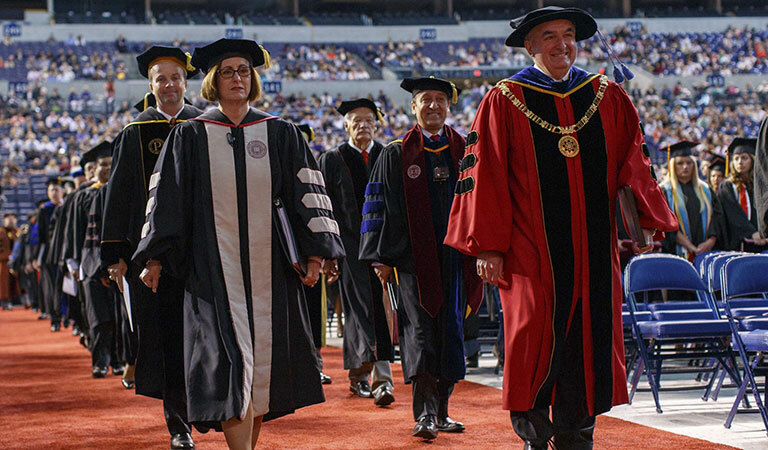 Wherever your next steps take you, your education at IUPUI has prepared you as no other could. It has opened the doors through which you are now walking into your future. And each of you knows that your future is more than your career: for some of you, it’s family, for some it’s faith, for some it’s service, for many it’s a combination of those. You have the knowledge and tools you need to be engaged citizens, making decisions that will affect our entire country. When I look out over this graduating class, I feel confident in our country’s future. Congratulations on all that you have achieved. Let’s hear it again for the Class of 2016.